My Anytone AT-868UV radio tips and links. Dave Casler, explains how stuff works, how to build, and some reviews. Ham Radio Concepts, I thought I knew was 80m was till I watch this. Informative for sure. OH8STN - A off-grid field radio operator. 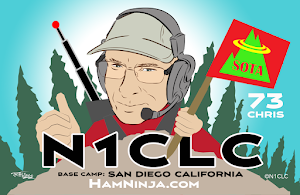 Julian's BLOG features other blogers as well and he is a leading guy in emergency comms prepping. He is serious about research, using the "LEGO BLOCK" approach, and seems to provide honest reviews. rms Express is a winmore email client. Allows you to do a winlink message or a peer-to-peer. NVIS antennas and "skip zone" The comms prepper did a short explanation on it and then put up a NVIS antenna. Digital Mode Comparison Document. This is a good BLOG entry on it.